OMEGA’s Model 70A audible alarms are the latest development in solid sound production. When 120 Vac is applied to them, a piezoelectric transducer operates as a solid state oscillator, resulting in a loud, audible alarm tone. A small, 29 mm (1.13") diameter hole is required for panel mounting. Solid state relays are used for switching large loads, and, in conjunction with pressure switches, they extend the power rating of the switch. 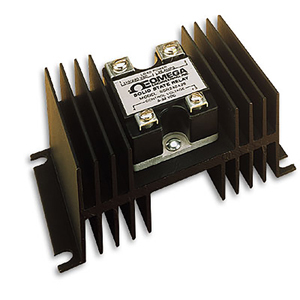 External dry contacts provide the controlling signal for this SSRL. Latching relays are used to extend the hysteresis or deadband range of the pressure switch. Delay relays are used to eliminate false pressure transients from sounding high alarms (Model TD-69). The TD-73 is used to prevent furnaces and compressors from quick restarts. See page C-59 for more details.